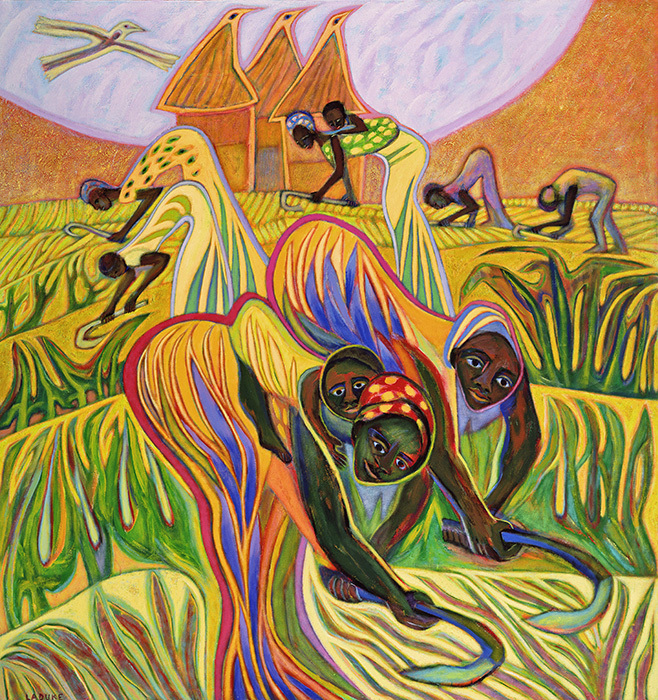 Millet Rhythms, 1992 (72"x68") (Africa). "Oregon artist and writer Betty LaDuke has gained an international reputation for her murals, paintings, and sketches. Her work tends to express socialist progress and life’s continuity, from images of America’s civil rights struggles, such as Play Free (1968), to women’s struggles for survival in war-ridden, spoiled lands, such as Eritrea/Ethiopia: Where Have All the Fathers Gone (1998)." Betty LaDuke: Social Justice Revisited is an exhibition presented through a collaboration between the Willamette University Archives and Special Collections and the Hallie Ford Museum of Art. The Archives holds LaDuke’s papers as a collection within the Pacific Northwest Artists Archives. The exhibition was made possible through the generous support of the Willamette University’s Green Fund provided through the Office of Sustainability. Betty LaDuke's own website, featuring her artworks, videos of her art exhibitions, a list of some of her books and cover art for books and journals, her biography, and much more. An article in the Oregon Encyclopedia about Betty LaDuke that includes good images of some of her artworks. 175 works by Betty LaDuke in the Online Collections of the Portland Art Museum. A website from Purdue University that features An Artist's Journey from Oregon to Timbuktu by Betty LaDuke, where LaDuke describes her artistic journey, with images of her works. A brochure from her exhibition at the Portland Art Museum from March 28 – July 19, 2015. This series celebrates Oregon’s agricultural workers. A biography and curriculum ideas from the Salem Art Association, a part of the Preservation of Oregon's Artistic Heritage Project. 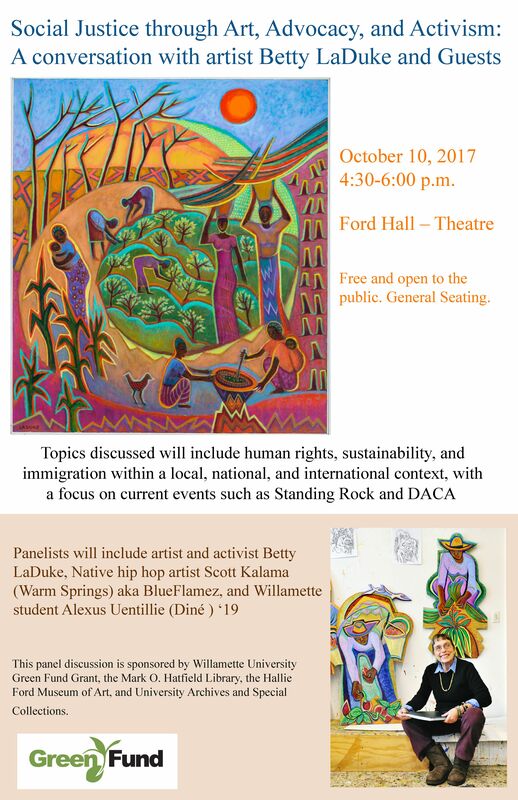 In addition to the exhibitions, LaDuke will be meeting with classes from the Department of Art and the Department of History, as well as taking part in a panel discussion on October 10, 2017, 4:30-6:00 in FORD Hall, Room 122. More work by Betty LaDuke is on permanent display on the 3rd floor of the Putnam University Center. Bountiful Harvest is the theme of the works on display in Goudy Commons which features artworks celebrating the farmers and farm workers of the Rogue Valley. In the Roger W. Rogers Gallery the theme is Border Crossings. These artworks capture the fear, anxiety, and hope experienced by people who have left their homes for another country. Survival, the exhibition on view in the Mark O. Hatfield Library, features paintings that depict scenes of survival in the face of forced migration, war, and environmental degradation. Right click on image to see larger image.